If Hollywood filmmaking often simplifies its characters and situations and is often the poorer for it, films like Brandon Colvin’s Sabbatical seemingly do many of those same things with far richer results. Perhaps it is glib to compare the two — Hollywood strips away in order to make things more comprehensible to the viewer; minimalist films like Sabbatical strip away but don’t explain away, leaving the essentials in stark relief while preserving complexity and mystery. In a film like Colvin’s, the viewer is never told where or why to look, but forced to engage the film on its own terms. To get on its wavelength is to be able to see in a way that only cinema allows. Colvin’s professed influences — Dreyer, Bresson, Akerman — devoted themselves to a cinematic asceticism that was at odds with many of their contemporaries, just as many of Colvin’s contemporaries rarely go quite as far stylistically (compare Sabbatical with another recent great independent, Some Beasts, a film that shares similar aesthetic goals, but whose pace zips by in comparison). Dreyer’s and Bresson’s religiously themed cinema in particular may have seemed out of step with the Existentialism of the time, but Colvin blends the two. 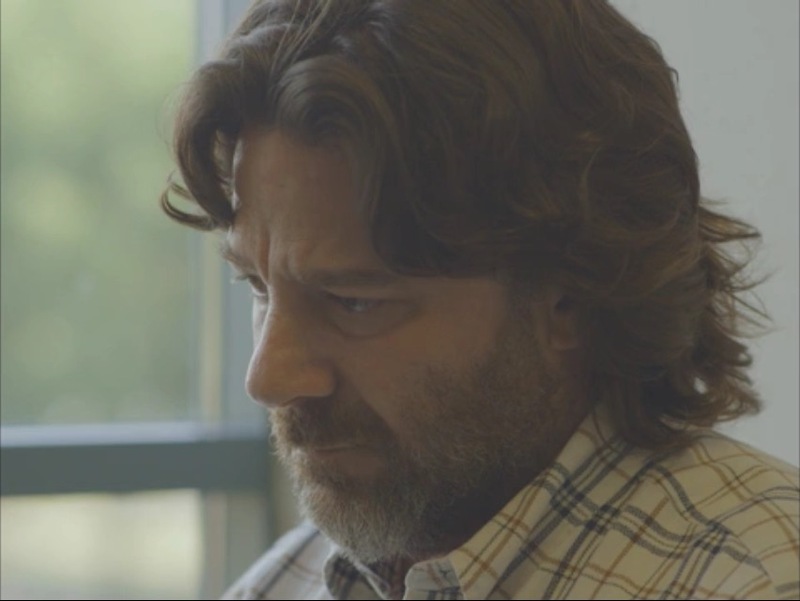 Sabbatical situates its main character Benjamin Hardin in a seemingly indifferent universe, where the tension between faith and doubt is felt in every one one of the film’s 60 or so carefully framed shots. Colvin’s view is like that of an apophatic theologian: God can only be defined in negative terms, by what He is not. It might be said that Benjamin Hardin is a sort of anti-audience surrogate, a character forever in thought but never telegraphing the same to the viewer, instead allowing us to understand him through subtle gestures, tones of voice, and especially, pauses and silence. When, in the beginning of the film, Sarah drives Ben to his mother’s house and tells him, “She’ll be happy to see you. It’s good, what you’re doing,” Ben’s long, silent side-glance toward her conveys about four or five separate emotions. If “anti-audience surrogate” sounds simply like a clever but empty way to describe Hardin, consider his entrance in the film’s first shot and exit in the last, as though the film’s world begins and ends with him. In both, Ben’s composure suggests a spiritual malaise, a deep unease with the world (the first shot cuts to a tighter shot of Ben in this pose, and it is telling that Colvin uses this image on one of the film’s posters). If the film’s style is to mean anything beyond itself, it is that it reflects this unease. In perhaps the film’s one scene of overtness, Ben’s religious inclinations are revealed when Sarah reads a passage from his in-progress book, a passage that expresses an ambivalence toward faith not unlike that found in Christian Wiman’s recent book My Bright Abyss, where Wiman’s words often echo Ben’s passage. But where Wiman’s brush with despair is earned (due to a potential terminal illness), Ben’s feels simply the product of wrestling with abstractions found in his carefully tagged and annotated philosophy books. He can’t even bring himself to attend church after accompanying his mother inside, instead sitting on a swing outside and staring off into the nearby graveyard. In one scene so desolate it is almost hilarious, Ben sits next to a microwave cooking his Hot Pocket, staring blankly into space after having learned Sarah has a boyfriend living with her. In a perfect world, this shot would be downright (in)famous. Nearly every scene in Sabbatical consists of one or two shots, the characters often stationary or moving very deliberately, their dialogue punctuated by long pauses. Their emotional distance from one another is obvious; beyond that, what can we infer about their relationships? The common bond between all the main characters is that they have some sort of shared past, however small. It is apparent, for example, that Ben and Sarah have known each other for a long time, probably many years. Nothing is ever said explicitly, but it is plausible that Sarah is Ben’s ex-wife — this would explain her closeness to his mother and her willingness to take care of her after her stroke. Ben’s strained relationship with his mother is conveyed through mundane, everyday disagreements, his voice often taking on a resentful tone when speaking to her. When he asks Sarah, “what was it like when she had her stroke?” with a tone of utter disgust, or says to his mother “I hate when you do this,” in the final scene, it’s clear that they have a storied, perhaps painful past, but Colvin only hints. With all the deliberate minimalism, it’s almost a wonder that Sabbatical never slips into a kind of stilted mannerism, although no doubt that criticism has been made. It is a truism that independent film offers alternate and perhaps new ways to tell stories, but I don’t think Colvin is very interested in that, to his credit. When people talk about “storytelling,” they’re usually referring to plot, and Sabbatical is totally plotless; a plot would only get in the way. Colvin is still interested in the things we all are, viewers and filmmakers alike, but he is interested in how form and style can seemingly be all but taken away (which, of course, is a style in itself), and how such an approach can tease out slivers of emotion other films treat as incidental. The result is a film of perfectly calculated restraint, whose themes and style are intertwined in such a way as to be inseparable. Negation, it seems, can be positive.